The Amalfi Coast from Sorrento and the Amalfi Coast is a spectacle of nature that becomes an unforgettable experience for those who visit. 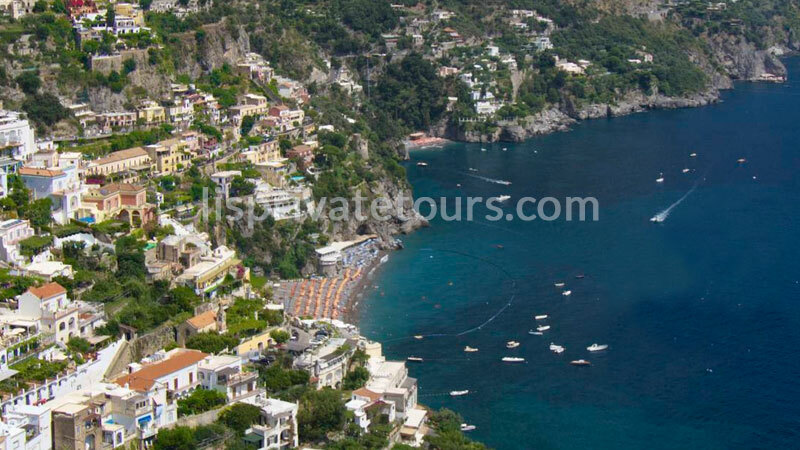 My tour lasting eight hours starts from Sorrento, touches the most beautiful spots of the Amalfi Coast, Positano, Amalfi and Ravello traveling along a winding road, overlooking the sea, which at every turn offers a breathtaking view. The waves crashing on the rocks thanks to the warm Mediterranean wind, the green slopes that follow the coastline from above, watch towers to defend against pirates, picturesque villages hidden among the coves … Every stop is a fantastic voyage discovering new places, smells and experiences. Today it still retains the charm of its houses built above the sea like a waterfall with characteristic colours bleached by the sun, peach, pink and terracotta. Like from a postcard its steep streets and stairways framed by clusters of wisteria where you will find delicious artisan shops, chic restaurants and fashion boutiques embedded. Continuing towards Amalfi along the coast we will find the fishermen’s villages of Praiano, Furore and Conca dei Marini where we will stop to admire the famous Grotta dello Smeraldo. 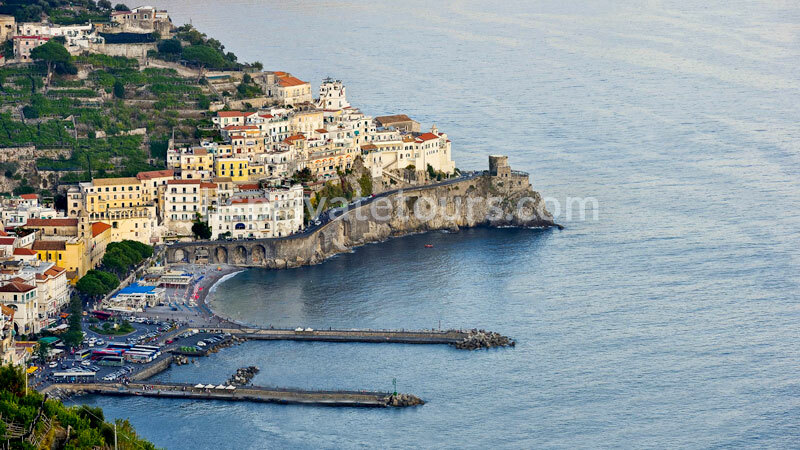 The beautiful town Amalfi, which gives its name to the whole coast, is a must-see for anyone visiting South Italy. The Cathedral of Saint Andrew the Apostle, in Arab-Sicilian style rebuilt in Baroque style in ‘700AD, with the wonderful staircase and its enchanting cloister which will leave you breathless. Amalfi will also surprise you with its little houses perched on the rocks , and the majestic spiked mountain bell towers which descend down into the sea, creating a magnificent meeting of land and water. Continuing to Ravello, our last stop, we find, just around the headland, Atrani: a picturesque maze of narrow streets and arches that tie themselves around the lively square and the beach. Ravello This charming town is located on the spur of a mountain 350 meters above sea level, far from the hectic confusion that reigns below. Ravello, in fact, is the fine goal of the Amalfi Coast. World famous for the charm of its villas: the gardens and the lookout point of Villa Rufolo and Villa Cimbrone that open out onto breathtaking views. In 1880 Richard Wagner found inspiration for his opera Parsifal strolling in the romantic garden of Villa Rufolo, restored in the mid 1800s by Scotsman Francis Neville Reid. Another Britain , Lord Grimthorpe, bought Villa Cimbrone in 1904 and made an extravagant villa with an astonishing view. Ravello is also home to the most beautiful church on the coast, the Cathedral of Ravello, and an outstanding example of contemporary architecture: the futuristic Auditorium New Energy Oscar Niemeyer, a structure of dazzling white concrete and glass overlooking the Gulf of Salerno designed to reflect the waves.